Considering that they took about an hour’s worth of footage — yeah, that’s my apartment in the background, they came and set up a little studio, it was all kind of weird, but they really liked my blueberry-mint lemonade — I’m amused by how carefully they edited these to trim out my babbling and “um”-ing. They make me sound so smart! I spoke as much about race as about gender, and a lot about the state of science fiction in the aftermath of Butler’s presence, so there might be more of these. In other news, The Killing Moon is up for a Goodreads Choice Award! It’s got some stiff competition, including books I’ve enjoyed lots, so it’s definitely an honor to be nominated (and reach the semifinals). And in social networking news, just a quick update: as you know readers, I keep track of most of the reviews I find on my novels over at Del.icio.us. There are new reviews of the Dreamblood books linked now. And I now have a Pinterest account, if you follow such things. Not much in it yet. 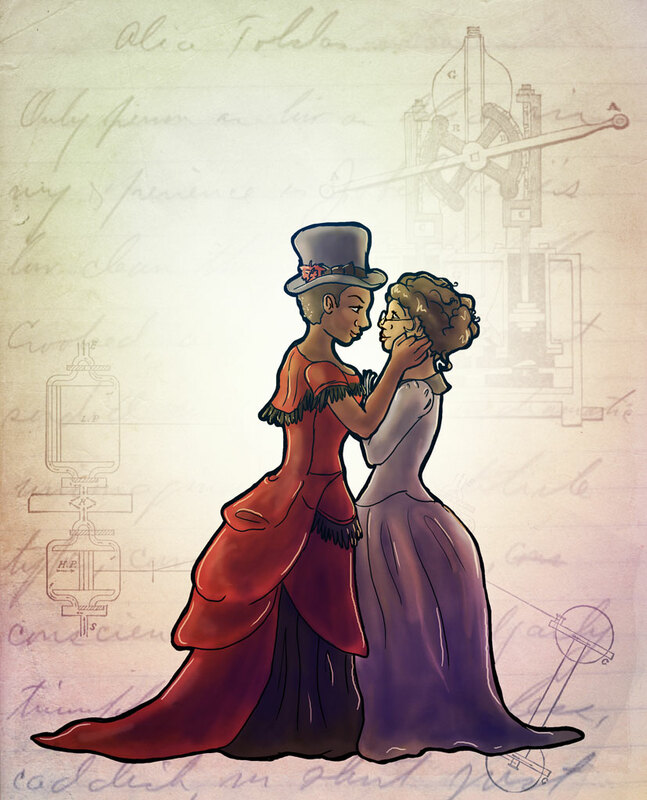 And to end on a lovely note, just saw this piece of fanart from sqbr on DeviantArt, based on the characters from my steampunk short “The Effluent Engine”. Isn’t it so cute and sweet? Go tell sqbr so! You are awesome. I am so glad we got to know each other in college so I can just hang along behind you telling people I know someone this awesome. I’ve often wondered at how few SF/F/Spec readers don’t know about Butler. I gab about her often; maybe this release will broaden her reach. Congratulations on all these glad tidings! You are one of my favourite new authors and I’m so please that you’re getting the recognition you deserve : ) Also, I was browsing Kirkus today and noticed that The Killing Moon is in the Best Fiction of 2012 list! ps: I haven’t read anything by Butler yet, but in my defense, I’ve only recently begun exploring non-YA fiction, and she’s definitely near the top of my ‘to read next’ list. Glad to hear the silence is just being busy. Knowing how hard NY was hit by Hurricane Sandy, I was afraid that might be the explanation. It’s awesome that Open Road is making so much of Ms. Butler’s work available to a new audience. I picked up an electronic copy of the “Xenogenesis” trilogy to go with the SFBC edition that I’ve had for years. Thanks for the heads up. The “making of” (and N.K.) fan in me would love to see the whole hour of your video, “um”s and all. Ugh, I wish I’d joined goodreads in time to vote. I just loved The Killing Moon. Congrats on the nomination! I’ll trade you my wife’s basil lemonade recipe for your blueberry-mint!